The Function layer control ( ) is only available for the Plane and Histogram plots. Use the Layers menu item or corresponding toolbar button to add an instance to the control stack. This control has three tabs, Function, Style and Label, described below. Which axis the independent variable varies along; options are currently Horizontal and Vertical. Name of the independent variable. This is typically x for a horizontal independent variable and y for a vertical independent variable, but any string that is a legal expression language identifier (starts with a letter, continues with letters, numbers, underscores) can be used. 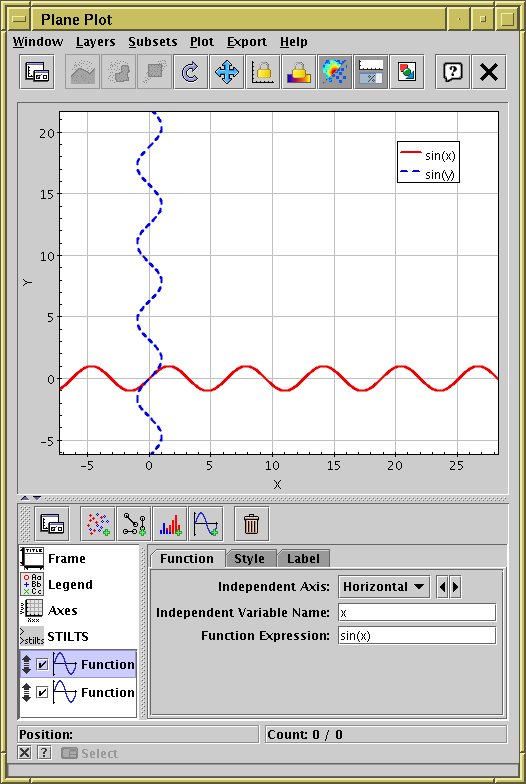 An expression using TOPCAT's expression language in terms of the independent variable that defines the function. This expression must be standalone - it cannot reference any tables. Thickness of the line in pixels. Dash pattern of the line - solid is the default, but various options are available. If true, lines are antialiased, which makes them look smoother on the screen or bitmapped export images. Has no effect on vector export images (PDF, EPS). Gives the label that will appear in the legend. By default the function expression is used, but if you want to override this you can deselect the associated Auto checkbox and enter your own value. If true, an entry for this function appears in the legend, if false it does not. Note the setting of this value does not affect whether the legend itself appears, which is controlled by the Legend control.